"...her dolls speak to me because they radiate a spirit of serenity. Goodness and purity are two words that come to mind. She also does very unexpected things with fabric, creating amazing juxtapositions." "I first came into contact with Shelley at her NIADA critique. Her work lived up to its reputation. Her dolls cry out to be hugged, but at the same time, they are serious works of art." "There seem to be many collectors and artists eager to accord Shelley Thornton a place of her own in the highest echelons of doll art." The character of my design for dolls has naturally evolved out of my illustration style, which is decorative, clear and simplified, with heavy outlines and solid, carefully orchestrated colors. Consequently, my dolls are relatively simple or stylized, and not overly embellished. Their visual interest relies largely upon the juxtaposition of the found patterns and colors of the fabrics. Most importantly, I strive for each doll to express an individual "presence." I shun extreme realism, and conceive of my work as dolls, not miniature replicas of human beings. I am fascinated by the notion that dolls, as objects, have long held a significant place in the human psyche, culture, and artistic expression, and I feel a profound urge to carry on in this tradition. In making dolls, I aspire to continue to mature as an artist, incorporating my experiences and the influences of the passionately expressive people I encounter, into an artistic statement that reflects my developing, unique point of view. I hope that my work will express who I am and how I am different from other artists. I feel a strong connection to the midwestern sensibility and way of life, which I believe is embodied in my work, allowing it to emanate a feeling of serenity. I am interested in an aesthetic which is grounded in beauty, sweetness, strong emotional content, intelligence, stability, passion, dreams and the unconscious, individuality, and the spiritual nature of human beings. I hope my dolls will be able to inspire some feelings or responses of familiarity in at least a few of those areas. I earned a BFA degree from the University of Nebraska in 1973. My major areas of study were printmaking and graphic design. I returned to the University of Nebraska to teach basic design, graphic design and illustration as a visiting instructor in 1975, and again to teach illustration in 1987-88. I worked as an illustrator and art director for an ad agency in 1977, and as a designer for Scholastic Magazines in New York in 1978, but the rest of my career has been as a self-directed, self-employed freelance artist. During college I began doing illustration work, and continued in that career for more than 20 years. I also designed and made illustrated wooden toys, and created some film animation. At age 28, I moved to New York City to pursue more opportunities in the field of illustration. There my client list grew to include Scholastic Magazines, Children's Television Workshop, Red Book, Rolling Stone Magazine, Parents' Magazine, Family Circle, Woman's Day, Ms. Magazine, Savvy, Ladies' Home Journal, Good Housekeeping, Bantam Books, Houghton Miflin, Avon, Health Tex, Bloomingdale’s, Macy's, and several New York ad agencies. I moved back to Nebraska after two and a half years, and continued to work for my clients in the City. My special interest became work for young children. 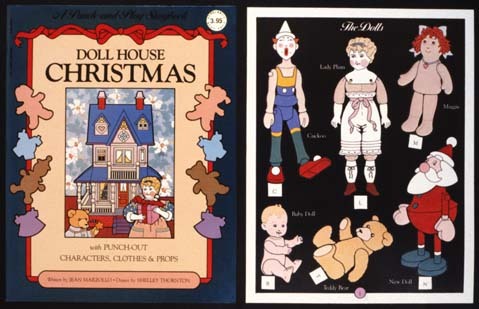 For thirteen years I did monthly assignments for the Kindergarten magazine, "Let's Find Out," published by Scholastic in New York, and through them also illustrated six children's books, five of which were stories with paper dolls (now out of print). I have been published in the annual of the Society of Illustrators in New York. In 1992, after the birth of my second child, I became less active as an illustrator, and the following year became interested in pursuing the art of dollmaking, in part since it is a type of work I found a bit easier to accomplish while being a dedicated stay-at-home mom. I have crossed over into this new medium of expression with more relish and fascination than I have had for any previous pursuit. It feels as if many of the different skills and interests I have developed over the years in relation to other artistic activities, have come together to serve me in this endeavor. In 1995, I was elected to membership in NIADA (National Institute of American Doll Artists). Feature article by John Darcy Noble, Doll Reader magazine, August, 1995. Feature article by Wendy Lavitt, Dolls, the Collector's Magazine, September, 1996. "Imagination in Any Dimension," by Krystyna Poray Goddu, Dolls, the Collector's Magazine, April 1998. "Wrapped Up in Cloth," Doll Reader, October 1998.